Stock up on feminine vintage inspired tops and dresses at the Beyond Vintage Friends and Family sale April 8th from 10am-7pm. 275 West 39th Street, 2nd Floor, NYC. 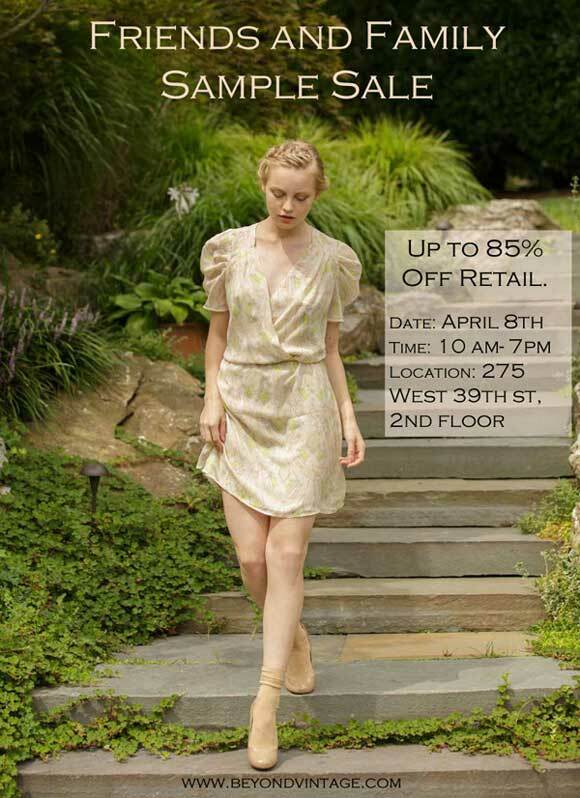 A Multi-Label Sample Sale is on Sunday April 7th from 11am-4pm. Save 30%-70% on fashion by Stylestalker, Stone Cold Fox, Luv AJ, and Janelle Leone. 1048 Santee St., Level 6, Los Angeles 90015. The Connected Festival is having a “Clotheschella Event” Sample Sale on 4/6 12-6pm. Save 2on Again, Boutique 9, Clover Canyon, Generic Surplus, Lomography, Hex, Tovar, Zanerobe and more. 1006 S. Olive St., Los Angeles 90015. I suggest this site to my acquaintances so it could be useful & informative for them also enormous effort you doing.